This year’s seemingly endless hot summer was a dream to some but a nightmare to others. To the operators of open-air theatres, it was certainly a boon. Outdoor drama has been popular ever since the plays of Ancient Greece, performed in settings that blended man-made architecture with the natural surroundings. Later, the enclosed theatres of the baroque era retained the outdoor element by using stage sets depicting landscapes, street scenes and grand houses. This style can currently be revisited in Haydn’s baroque puppet opera ‘Philemon und Baucis’, showing at the Bautzen Theatre in a specially designed and arranged production. At the Bayreuth festival opera, the open air was brought inside for the new ‘Lohengrin’: A giant backdrop in various shades of blue portrayed a dramatically overcast sky, which glowed formidably thanks to clever light design and strong light sources. For this year’s Ruhr triennial, meanwhile, the gigantic Jahrhunderthalle venue in Bochum was left in its ‘natural’ state – just with a few stage elements added – for Christoph Marthaler’s production of ‘Universe, incomplete’. It was the first time a performance has taken up the entire hall and held it together by the sheer force of the elaborately amplified sound. Before the hall in Bochum became an arts venue, it was used by the coal and steel industries. A current sound installation in Glaskasten Marl, part of a major project titled Kunst & Kohle (‘art & coal/money’), echoes mining sounds from the pits in a tribute to 200 years of industry. Read more in our sound supplement Ton, which continues the indoor/outdoor theme. On one end of the spectrum, the open-air production ‘Maria de Buenos Aires’ at the Kasematten in Graz uses innovative sound technology to create the impression of a performance in an enclosed opera house. On the other, indoor venues are increasingly applying the concept of immersive sound to enable audiences to forget the walls around them and feel surrounded only by sound. With reports on current renovation and building projects, this issue closes by looking indoors. Many venues, not only here in Germany, are in urgent need of renovation. One example is the Tartu theatre in Estonia, being modernized with the help of German specialists. The new Bridge Theatre in London, by contrast, has been built in true British style and with American expertise – providing a foretaste of life after Brexit. Art- and theatre-makers and their suppliers are not the only ones who are dreading Britain’s departure from the EU – all the more reason for ‘the continent’ and ‘the island’ to stay in close contact! 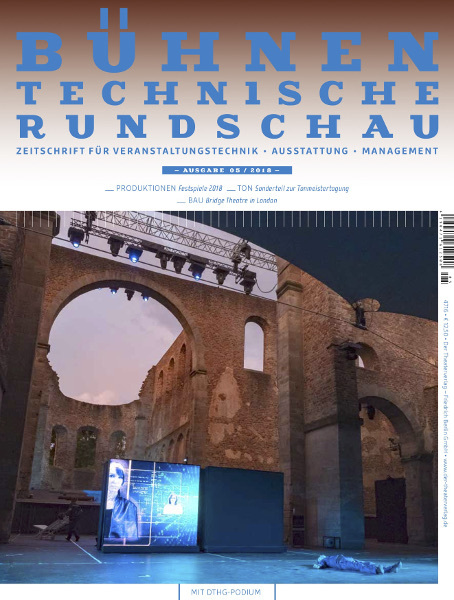 The enclosed copy of Podium has all the latest information on the DTHG German stage technology society’s autumn programme as well as cooperation projects with China and South Korea and news from the world of professional training. We hope you enjoy this issue, inside and out!